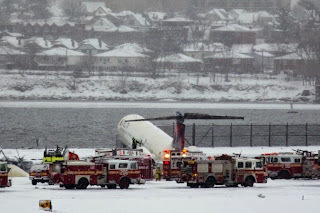 Back in March of last year, a Delta MD-88 slid off the runway in a snow storm at LaGuardia. The aircraft was heavily damaged but there were no injuries. I wrote about that incident here. To recap, the aircraft landed in really lousy visibility during a snowstorm and slid off the side of the runway and almost into Flushing Bay. 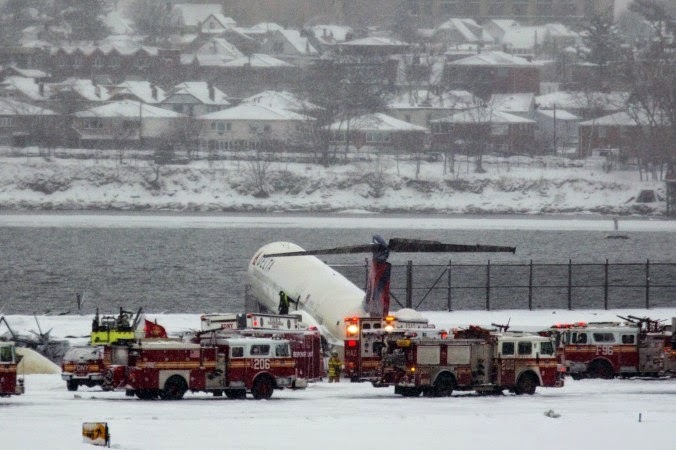 While the approach and landing were normal, the aircraft drifted off the left side of the runway after landing, eventually hitting the airport perimeter fence and coming to a rest on the berm that borders the airport and the water. Since the winds were not particularly strong, my first guess was that the problem might have been a braking problem, but that was not the case. The NTSB recently concluded their investigation of the incident and have blamed the accident on an obscure directional control characteristic of aircraft with tail mounted engines known as "rudder blanking" along with the pilot's reaction to that effect. The full accident report can be found here. Inherent in the design of turbine powered aircraft with tail mounted engines and thrust reversers is an effect known as rudder blanking. Shortly after touchdown, pilots command the thrust reversers open using levers located on the throttles. On the MD-88, the aircraft involved, baffles actually close over the exhaust of the engines and redirect the thrust to the sides and forward of the engine. This redirected thrust helps to slow the aircraft. The problem with this configuration is the location of the engines on the rear fuselage near the tail of the aircraft. The redirected thrust also has the effect of reducing the relative wind over the vertical stabilizer and rudder. Reducing the air over the rudder reduces its effectiveness. The reduced rudder effectiveness combined with the crosswind allowed the aircraft to depart the left side of the runway and to hit the boundary fence. Boeing (which purchased McDonnell Douglas, the manufacturer of the MD-88) was aware of the flaw and recommended that reverse thrust was not to be used at full power during landing. Boeing recommended a further restricted use of reverse thrust when landing on a runway "contaminated by clutter" which is aviation-speak to mean a buildup of snow or slush. Due to the geometry of the MD-80 thrust reversers, the exhaust gas efflux pattern will, at certain rollout speeds and EPR settings, interfere with the free-stream airflow across the rudder surfaces. This will result in partial “rudder blanking”; with a resultant reduction in directional control authority. As rudder effectiveness is more critical on wet or slippery surfaces, “rudder blanking” becomes a concern above a reverse thrust level of 1.3 EPR. Normal dry runway maximum reverse thrust power is 1.6 EPR [emphasis in original]. Will the Brakes Stop the Airplane on the Runway? Another concern of the crew was the "braking action" on the runway. This is also aviation-speak to mean the slipperiness of the pavement. The crew had heard reports that the braking had been reported as "fair" which meant that they would not have been able to stop the aircraft on the runway and would have needed to divert. Later on in the flight, the braking action had been reported as "good" by another airliner and the crew made the decision to continue. The problem with braking action reports by other aircraft is that they are highly subjective. Some pilots make the determination by how many times their anti-skid cycles during a landing. Others use different criteria and each aircraft can respond differently to the same conditions. One pilot's "fair" report can easily be another's "good". Weather and runway reports from the airport itself indicated that the runway was covered with 1/4 inch of wet snow. The runway had recently been swept, but by the time Delta 1086 landed, it was already white in appearance from new snowfall. So you can see that as a minimum, this crew was concerned that they didn't have much room for error on this landing. As far as the actual condition of the pavement, airport authorities have been using friction measuring equipment for decades. So what was the actual friction measurement at the time Delta 1086 landed? No one knows. Due to bureaucratic ambiguity and confusion between FAA directives and the New York Port Authority, the Port Authority elected to not use either of the two trucks it had available to measure runway surface friction. From a bureaucratic point of view this makes perfect sense as you can be held liable for inaccurate or missing reports if your policy was to collect them. Change your policy to keep the trucks parked and you're off the hook. This works best for bureaucrats sitting in heated offices, but not so well for passengers landing in a snowstorm. But it's completely legal. So in essence, the story so far is that the aircraft landed in 1/4 mile of visibility in a snowstorm on an extremely short runway bounded on three sides by water with an essentially unknown slickness of the pavement. As a reminder, a quarter mile of visibility is 1320 feet and a touchdown speed of 140 kts is about 236 feet per second. This gave the pilot about five and a half seconds of time between seeing the runway and landing on it. And according to the flight recorder, the touchdown was well within the landing zone and on speed. nose to the ground after main gear touchdown, he moved the thrust reversers to idle and then “one knob width on the reverser handle” to obtain Delta’s target setting of 1.3 engine pressure ratio (EPR).16 FDR data showed that engine reverse thrust exceeded 1.3 EPR between 3 and 4 seconds after main gear touchdown (with the left engine exceeding 1.3 EPR before the right engine) and was advancing through 1.6 EPR immediately after the nose gear touched down. FDR data showed that the EPR value exceeded 1.6 for 5 seconds, reaching maximum EPR values of 2.07 on the left engine and 1.91 on the right engine between 6 and 7 seconds after main gear touchdown. Engine power decreased after this point, and the thrust reversers were stowed at 1102:25 (7.5 seconds after deployment, 9 seconds after main gear touchdown, and 2,500 feet from the runway threshold) at an EPR value of 1.8 on the left engine and 1.6 on the right engine. At that time, the airplane’s groundspeed was 93 knots. In plain-speak, the pilot used reverse thrust in excess of the recommended amount for a total of five seconds and then stowed the reversers. The aircraft started to drift left at six seconds after touchdown, or three seconds before the reversers were stowed. This meant that it was in the three seconds between the time the aircraft started to drift and the time the reversers were stowed that the problem occurred. To further complicate the landing, the aircraft by this time had slowed to 93 knots. At this speed the rudder itself loses effectiveness as there is not enough air moving over the surface to keep the aircraft on the runway. Other than the rudder, directional control of an aircraft on the ground is obtained through the use of nosewheel steering and differential braking. Both of these were used but were not effective enough to get the aircraft under control. Pilots are goal oriented people. We like to get the job done. But we are also called upon to get the job done correctly and are tasked with being the final arbiters of safety. To this end, we are given the tools and the criteria to use those tools correctly. But when some of the supposedly objective information we have turns out to be highly subjective and incomplete, the process becomes a crapshoot. In my view, these guys were set up. They were told that if the braking was "good" they could land, but if it was "fair" they'd go for a swim. So for a few seconds the pilot overcompensates with too much reverse thrust and they nearly go swimming anyway. Another MD-88 had landed minutes before and had no problem while also exceeding reverse thrust limits. These guys just got hit with an unlucky gust of wind. The whole idea of risk management is to make sure that the operation does not become a crapshoot. Had these pilots diverted when the "system" said they could make it safely and other airplanes were landing, they'd be questioned by their chief pilot and ridiculed by their passengers. Now they're probably wishing they had diverted. A three second and immediately corrected deviation from SOP during extreme conditions should not result in a major accident. As a former airline pilot for over 20 years, I’m confident saying that having to limit reverse thrust on a relatively short, slippery runway is counter-intuitive: When you need it the most, you have to use it the least. So the next time your pilot diverts or goes around when others are landing, you will be frustrated or angry that you don't get to your meeting or home on time. Don't be. The guy or gal up front is trying to get you where you're going, but also trying to keep you alive. I'm going to take a moment to say a few words about the NTSB. Good words. The NTSB in my view is a national treasure. They are staffed with a group of smart and thoughtful professionals who take the time to get to the bottom of the accidents they investigate. And while they don't have any real regulatory power to force changes, nor do they make economic cost-benefit assessments of their various proposals, their recommendations often serve as signposts to be disregarded by industry and regulators at their peril.